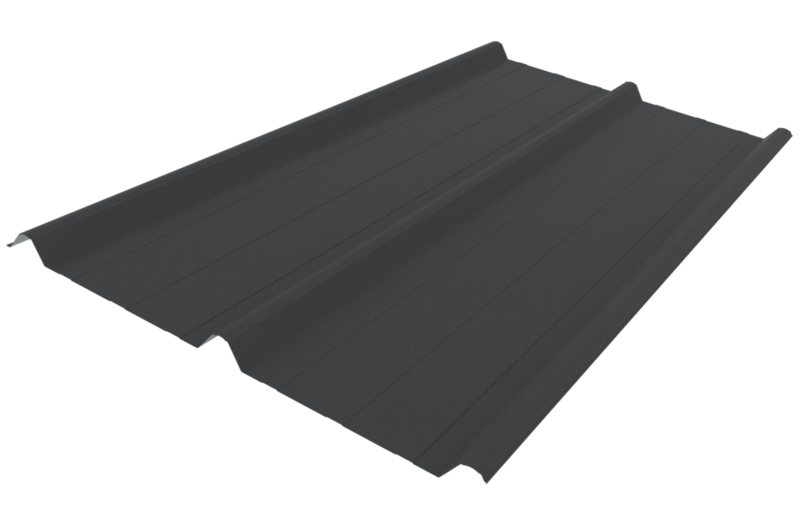 Solar-Rib ® is an attractive, linear roofing profile that is expressive in its design. Suitable for Residential, Light Commercial and Commercial applications, Solar-Rib® can also be paired with Dimond Roofing’s ® Photovoltaic Laminate (PVL) solar power technology to provide the added benefit of electric power generation – harnessing the power of the sun’s energy. PVL is a flexible technology and can be added to Solar-Rib® at the time of installation, or at a later date. (1) Recommended maximum purlin spacing’s at minimum radius. (2) Based on 1.1kN point load support, but not intended for roof access. Sheet lengths: Solar-Rib® is custom run to order. In any category, spans above the maximum shown should not be used. Category 2 maximum spans are based on static point load testing as a guide, and further limited by practical experience of roof performance under dynamic foot traffic loads. Category 3 maximum spans are limited as a guide to achieving satisfactory appearance for wall cladding. Loads given are based on 2 screw fasteners/sheet/purlin (x) = one stitching screw between mid-span purlins, (y) = two stitching screws per mid-span purlin. Loads given are limited to a maximum of 2.5kPa. If design requirements exceed this limit, Contact Dimond Roofing for specific advice. End span capacities given in this table are based on the end span being 2/3 of the internal span. No Deflection or permanent distortion that would cause unacceptable appearance, side lap leakage or water ponding, due to foot traffic point loads, inward or outward wind loads or snow loads. The span capacity of Solar-Rib® is determined from the Solar-Rib® Limit State Load/Capacity Chart using the section of the chart appropriate to grade and type of material, and to the category of serviceability selected from the three categories below. Serviceability loads have been derived by test to the NZMRM testing procedures. To obtain an ultimate limit state load we recommend factoring the serviceability load up by 1.4 in-line with NZMRM guidelines. The capacities given do not apply for cyclone wind conditions. Expect occasional foot traffic educated to walk only on the purlin lines, in the profile pan. Walkways installed where regular traffic is expected, and “Restricted Access” signs placed at access point. Walls or roofs where no foot traffic access is possible or permitted. If necessary, “No Roof Access” signs used. Fasteners that are used to secure Solar-Rib® down as a roof cladding must penetrate into the purlin a minimum of 30mm for timber and 6mm for steel purlins. For wall cladding the fasteners must be long enough to pass through the substrate, cavity batten and into the solid framing by 30mm for timber and 6mm for steel. 1. A 30mm bonded (BRA) washer may be used in low and medium wind zones and when the sheet length is less than 7m. Periphery and valley lines must still have a load spreading washers used. 2. When using bonded washers remove the neo from the fastener prior to installing. 4. When using Load Spreading Washers a 12mm (clearance) hole is to be drilled for the 36mm diameter EPDM seal. For screw size range and fastener/washer assembly refer to Section 2.2.3.1of Technical Manual. Long spans may require specification and use of side lap stitching screws – Section 2.3.2 C Installation Information: Layout and Fastenings of Technical Manual. Restricted access roof, 0.55mm G550 steel Solar-Rib® has a maximum end span of 1300mm and a maximum internal span of 1900mm. The following distributed load capacities apply.